I was recently reminded of how great my mother is, by a female impersonator. 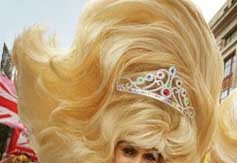 Not that my mother is in the habit of frocking up in sequins and the CN Tower of blond wigs, per se…. Actually, that’s not strictly true. Anyway, she is far too short to be a drag queen herself. So instead, she surrounded herself and our little family with a bunch of wonderful, colourful, clever characters. Our family friends ran businesses such as Polly’s Follies, were part of the original Les Girls troupe, and we regularly attended DIVA (Drag Industry Variety Awards), as a family. We became skilled at the true art of applying make-up, how to dance in platforms, and discovered all about glitter, glamour and the most fantastic sense of humour. We learnt all about Oxford St shenanigans from the comfort and security of backstage with family. We learnt - not from any class at school, the dangers and sadness of HIV. We discovered that family can be not only blood lines, but in a world where some are extremely ostracised, family are those who support, love and care for you. No matter the colour of their wig. Of course there was a lot more to her parenting than these exposé’s: She was, I realise now I’m raising my own kids, very strict. But an overriding lesson she taught us was highlighted to me the other night: That our mother brought us up to accept everyone, see who they are past the facade and the antics. But she didn’t teach us with words, she taught us with her own actions: Her own open heart and mind, her patience and fantastic sense of humour. This extended through to our friends: Our house was always open to them. They were cooked for, had beds made up on our floor, and laughs…did we laugh. All sorts of fun parties were regularly held at our place, possibly, I suspect now, to monitor teenage activity, but many were my sister and I with a bunch of mum’s hilarious adult family friends. Mum took some of our friends in to live with us in our already squashed house during difficult times of their own, and she accepted some boyfriends which I know would challenge my own acceptance as a mother now. But I guess she could see the beauty in them all, just as we did. Or perhaps even that they needed a mother’s love too. How great though art, that mothers love. How blessed I am.